Vancouver's skyline backs Vancouver Harbour and Stanley Park. British Columbia’s largest city is a natural choice for urban renewal. Service with a smile at Ancora. Backed by snowcapped peaks, bordered by the sea, and blessed with a thriving culinary and craft beer scene, Vancouver, B.C., has it all. “Whether you’re an outdoor enthusiast, culture buff, foodie, or parent seeking family fun, you’ll find plenty to do in this exciting international city,” says Bothell, Washington-based Virtuoso travel advisor Ian Johnson. “For active types, there’s freestyle mountain biking, kayaking, and skiing. Add excellent shopping, diverse dining options, and lively nightlife to the mix, and you’ve got the perfect weekend getaway - one that’s an easy drive from Seattle and Portland, or a nonstop flight from many other U.S. and Canadian cities.” Because Vancouver is the port of embarkation for many Alaska cruises, Johnson also encourages clients to stay for a few extra days pre- or post-voyage. Start with an over-the-top view of the city, its surrounding North Shore Mountains, and British Columbia’s coastline via seaplane. Flights depart daily from Coal Harbour, just steps from the stylish Fairmont Pacific Rim hotel. Then, for a bigger picture, walk a few blocks to Canada Place for a ride on FlyOver Canada, a flight simulator over the country complete with wind, mist, and scents. Continue strolling to Gastown, a National Historic Site, for happy hour. Locals love Pourhouse (5 to 6 pm daily), with its Old West saloon feel, and elegant L’Abattoir (5:30 to 6:30 pm daily), which offers creative appetizers (try the baked Pacific oysters with black truffles) and a new specialty cocktail each evening. 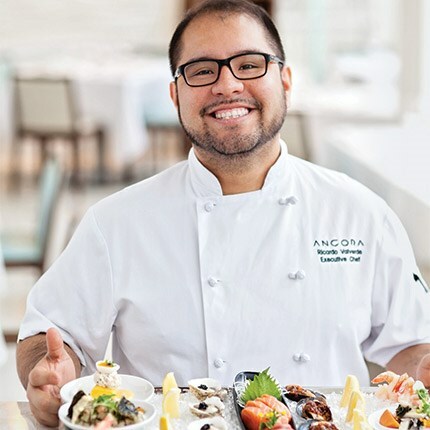 “There’s no shortage of great restaurants in this multicultural city,” adds Johnson, who steers friends and clients to Ancora. Located on the waterfront in Vancouver’s West End, it dishes up “stellar Japanese-Peruvian fusion food” complemented with views of False Creek and Granville Island through floor-to-ceiling windows. Rise early and head to Café Medina, a buzzed-about breakfast, brunch, and lunch spot in Vancouver’s burgeoning Library District. Lines can be long, especially on weekends, but the dishes are well worth the wait. Try the Belgian waffle with a choice of toppings that span salted caramel to white chocolate pistachio rosewater or, for something more substantial, go for the fricassée with braised short ribs. Definitely order the café’s signature lavender latte. A quick taxi ride (Vancouver doesn’t have Uber) takes you to Granville Island (technically a peninsula), where you can rent a kayak and paddle down calm False Creek to see the city from an entirely different perspective. (If your balance is good, opt for a stand-up paddleboard.) Be on the lookout for harbor seals and eagles. Back on terra firma, take time to explore Granville Island’s artisan shops and lively Public Market. For families, the Kids Market comprises 25 shops housed in a century-old factory and, during summer, the largest free outdoor water park in Canada. The city is always evolving; take edgy Railtown, for example, a newish industrial-chic neighborhood east of Gastown known for artist lofts, design shops, and the eponymous Railtown Cafe. Don’t leave Vancouver without trying one of its made-to-order gourmet sandwiches on artisan bread (the poached-salmon salad is a standout) and house-made ice creams. “You’ll want to spend time in Stanley Park, Vancouver’s most prized possession,” says Johnson, who recommends walking north along the seawall beginning at English Bay or north through Coal Harbour from Canada Place. Better yet, hop on a bicycle: The city’s recently launched bike-share program offers 24/7 access at user-friendly docking stations or, if you’re staying at the Fairmont Pacific Rim, take one of the hotel’s BMW models out for a spin. (“Bike butlers” will pump your tires, fit you with a helmet, and send you off with a water bottle, bike lock, and map.) First-time visitors to Vancouver should consider a guided bike tour that includes numerous stops and entertaining stories about the city’s culture and history. Have your travel advisor arrange a relaxed three-hour trip circling Stanley Park; a longer ride that also visits Granville Island, Chinatown (Canada’s largest), and Gastown; or even a craft-beer bike tour with tastings at local breweries. A few favorites: Postmark Brewing, Bomber Brewing, and Main Street Brewing. Later, reward yourself with a handcrafted gelato at Bella Gelateria. No hyperbole: This is one of the world’s best – its pecan and Canadian maple syrup flavor took first-place honors at Florence, Italy’s Gelato Festival in 2012. Wrap up your three-day vacay with a bliss-inducing trip to the spa. At Fairmont Pacific Rim’s Willow Stream Spa you can soak up harbor views on an outdoor deck with private Jacuzzis, an infrared sauna, and meditation pods, then go all-out Canadian with the 90-minute Coastal Mountain Retreat, highlighted by a maple-sugar scrub. Prefer a full-body wrap with regionally harvested algae and British Columbia glacial mud? Schedule the 80-minute Tides treatment at Rosewood Hotel Georgia’s Sense, A Rosewood Spa. STAY: Virtuoso has six hotels in Vancouver. At each, Virtuoso travelers receive a room upgrade (if available), breakfast for two daily, complimentary Wi-Fi, plus early check-in and late checkout (if available). Here’s a sampling. 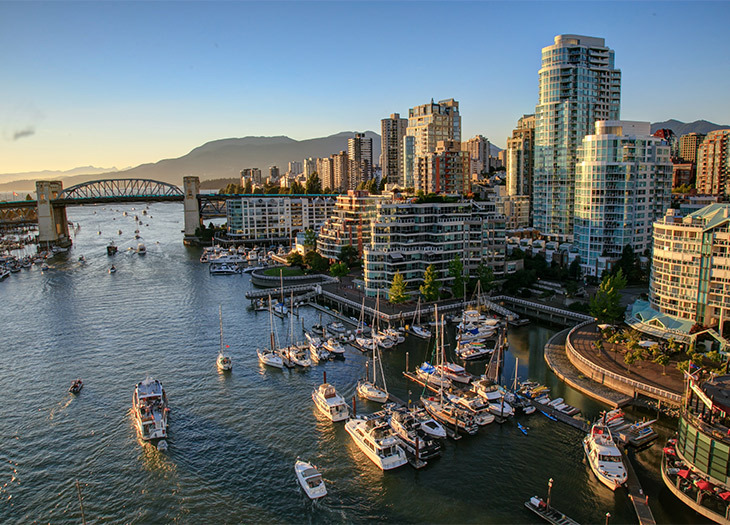 Close to the harbor and its cruise ships, both the 489-room Fairmont Waterfront and 367-room Fairmont Pacific Rim offer walkable access to the city’s top attractions. Check out the Waterfront’s 2,100-square-foot herb garden and rooftop honeybee apiary and the Pacific Rim’s impressive international art collection. A top choice for families, the 372-room Four Seasons Hotel Vancouver claims the city’s only indoor-outdoor pool, a kids’ concierge, and a complimentary camp during school vacation times. Another draw: YEW restaurant, with a focus on sustainable seafood. Nat King Cole slept here – as did Marlene Dietrich and Katharine Hepburn. Vancouver’s most historic property, the 156-room Rosewood Hotel Georgia recalls the Roaring Twenties but with a refreshing contemporary twist. The hotel’s Hawksworth Restaurant is a four-time winner of Vancouver magazine’s Best Upscale Restaurant award. PLAY: Your travel advisor can work with Virtuoso’s local tour provider, Entrée Canada, to craft customized experiences in the city – everything from insider culinary tours and winery visits to biking and kayaking excursions tailored to your skill level.